This past week, I had asked my wife if she had any dinner ideas, or if there was anything she wanted to eat. She immediately fired back with homemade pizza with garlic cream sauce and mushrooms. Now I am personally a big fan of any pizza with garlic cream sauce, especially if it has caramelized mushrooms on it, and possibly some onions. I was open to the idea of this pizza she had in mind, but I also had ideas of my own. I wanted that pizza to have a bit of ‘pop’ to it, if you will, and a bit of acid. This is when I thought of the simplicity of slow roasted tomatoes. 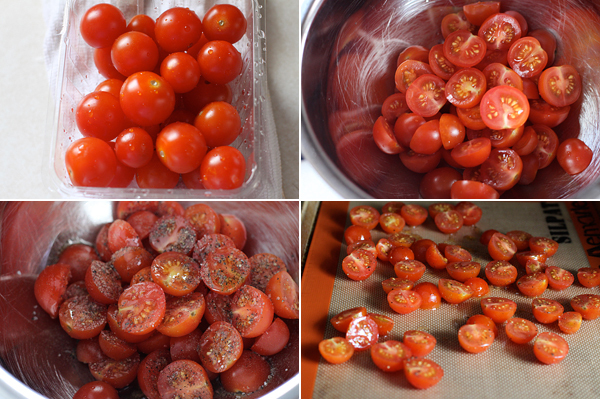 If you never had roasted tomatoes then I highly encourage you to make some. There is something about the intense flavor that is just awesome. I’ve used them on pizza, omelettes, and even sandwiches, and as a person who never really liked tomatoes while growing up, well, I love these. There is nothing more simple than this recipe. Four ingredients that will make your other recipes spark. To a small mixing bowl, add the tomatoes, the olive oil, and salt and pepper. Gently stir. 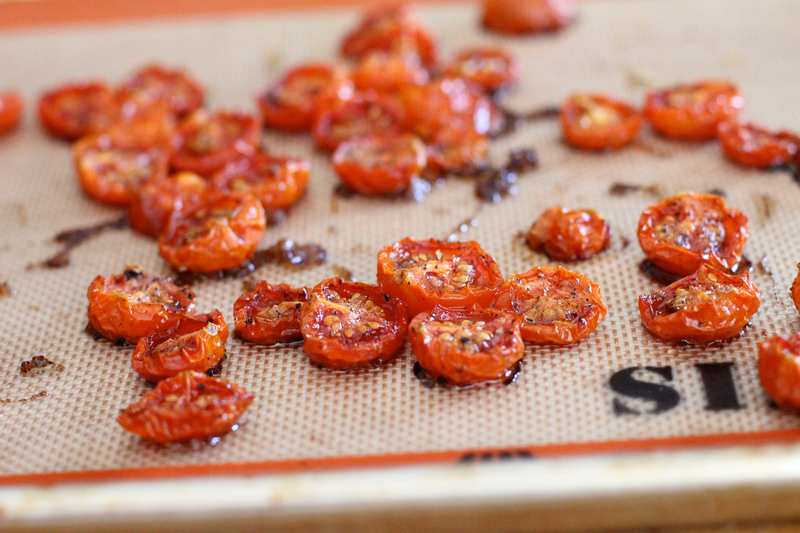 Lay the tomatoes onto a baking sheet lined with a Silpat or parchment paper. Place in the preheated oven and cook for 2 1/2 hours. Don’t you just love that? A five minute preparation, then set it in the oven, forget about it, and come back a couple of hours later? I love that. After 2 1/2 hours you will notice the tomatoes have shrunk in size and all of that great tomato flavor compressed into a smaller tomato. Let the tomatoes cool before storing in a air tight container. Again, when I placed these on the pizza, and only about six of them, they really brought out this intense, and very bright flavors of the pizza. They are slightly acidic, almost as bright as a lemon would be, and are really fantastic on pretty much anything. I think you will most likely be making these more often than you think, they are that good. I hope you enjoy! Place in the preheated oven and cook for 2½ hours. After 2½ hours you will notice the tomatoes have shrunk in size and all of that great tomato flavor compressed into a smaller tomato. Let the tomatoes cool before storing in a air tight container.